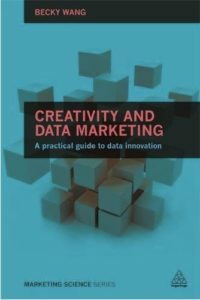 This part consumer-focused primer and part textbook is meant to be a starting point for dialogue around data (this which is the currency on which digital is built) and creativity (that which is the last of things that make us human) and how it applies in marketing (including AI and machine learning). This book, commissioned by Kogan Page, a UK-based trade publication focused on marketing and advertising, selected me as a first-time author based on the following article: Quantitative Hitman. What came out of this article was a year long plus journey to document what I had learned in the creative agency environment that’s applicable to both big brands and start-ups. The practice of starting a data practice in a creative environment – be it entrepreneurial, agency, innovation-focused organizations, or creative company, this book covers the topics that plague creative companies, organizations, and individuals attempting to digest what’s happened in the last 10+ years of conversation surrounding data and creativity, innovation, and digital marketing and introduces an organizing narrative to think about their companies and marketing organizations differently. The book introduces a battle-tested process of combining analytic and creative thinking to introduce big ideas that work in both the design of products and in the communication to customers (which share the principles as the scientific method and design thinking). In addition to the existing copywriter/art director pair, there are new combinations of teams to produce powerful marketing programs — this book outlines other vital team members and combinations that has already begun to transform the industry. The outcome of creative and data marketing has elevated the marketing practice of content marketing, better creative to channel optimization, more accurate targeting for improve ROI, and most importantly, stronger, more effective creative communications. Creative and data marketing contextualizes buzz terms and acronyms into effective processes and partner conversations to deliver on the most important mandate of today’s marketing organizations: listen to, engage, and inspire our customers. This is the foundational book for the innovation and content studio co-founded by Becky and that puts these practices into action through Crossbeat’s work on digital transformation, active design, artificial intelligence, the future of service, content innovation, and the data layers behind augmented reality.